In Sid, exhaustion is visible everywhere. It’s in the darkened eyes of a mother carrying her sleeping baby off an overloaded bus. It’s in the tantrums of exhausted, frightened children being dragged by equally exhausted parents to wait in line for the next train north. It’s in the sagging shoulders of a man carrying his only belongings in a worn garbage bag. The town’s humble train station came into the spotlight last year when refugees and migrants, barred from entering Hungary, changed their route to reach Germany and other destination countries in northern Europe by going first through Croatia and then Slovenia—a route that takes them through Sid just six kilometers (3.7 miles) from the Croatian border, along the way. The place hasn’t been the same since, swollen with asylum-seekers who arrive in the hundreds and line up to board trains that will take them on their way. 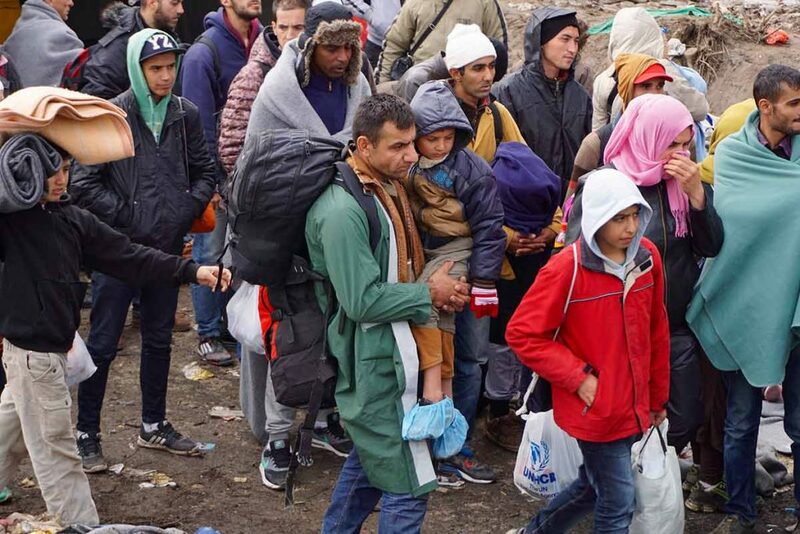 By the time they have reached Sid, refugees and migrants have traveled well over 1,000 kilometers (620 miles) across at least three international borders, most often from Turkey to Greece by inflatable raft and then over mainland Greece by bus to Macedonia and then Serbia. Sporadic transportation disruptions and temporary border closures can leave them stranded and forced to sleep in the open. Conditions inside the buses and trains are dirty and wildly overcrowded. The physical toll of the journey is evident not only in people’s expressions and body language, but also in the symptoms of patients shuffling in and out of the primary health care clinic that International Medical Corps runs at the station with its local partner IAN. The doctor at the clinic estimates that 85 percent of patients come seeking care for respiratory infections as a result of being exposed to the cold and traveling in such crowded conditions. The clinic normally sees about 50 patients every day, but on my first day there, January 27th, a train was cancelled, which kept people at the Sid station longer. Eighty-one people sought care that day, making it a particularly busy day shift, which runs from 8 am to 4 pm before a night team takes over. Sixteen-year-old Hedye was among those who came to the clinic that day. The only English speaker in her family, she translated for her mother, father, and brother, all of whom were suffering from flu-like symptoms. At the time I met them, they had been traveling for two weeks straight across five countries. An Afghan family, their dream to start a new life in Europe sent them walking for hours in the snow on the borders of Iran and Turkey, climbing aboard an inflatable dinghy on the shores of the Aegean Sea to reach Greece, and crowding onto ferries, buses, and trains. They traveled with whatever savings they had and the clothes on their backs. But the voyage across Europe weighs people down not just physically, but emotionally as well. In addition to a doctor and a nurse, the clinic has full-time psychosocial specialists who are there to provide what support they can as people are in transit. Salaheddine, a 26-year-old with a university degree in computer studies from Morocco, hasn’t slept in days. He left home two months ago, hoping to find work in Europe. Instead, he has only found obstacle after obstacle. When I met him, he had been stranded in Sid for 15 days, unable to move onto Croatia. And the $4500 he saved to get him to Europe? Gone. Because Morocco is on Germany’s list of safe countries it will be next to impossible for Salaheddine to win asylum, unlike those from Syria, Iraq, and Afghanistan. This leaves him and many others like him in migration limbo with neither the paperwork needed to move forward nor the money to return home. Milica, who is trained in psychotherapy, met with Salaheddine and about a dozen or so of his friends, who are all from North Africa. They talked about what life was like at home, what made them come to Europe in the first place, and what the journey has been like. Then Milica pushed gently deeper, asking them about how the journey has impacted them emotionally. “When I left Turkey, I thought my life would change,” said Salaheddine. “But in Greece my mind changed.” He went on to explain how he feels sad, angry, and helpless—emotions that Milica says are normal. She stressed the importance of being patient with himself and his feelings. She then encouraged him to sleep, to which Salaheddine confessed he had gotten next to nothing of between waiting for trains, trying to cross the border at night, and sleeping in the crowded train station or the forest nearby. He agreed to try. In January alone, more than 55,000 people entered Serbia from Macedonia and Bulgaria, while thousands continue to arrive on the shores of Greece each day by raft. Most of them will be in Sid after about a week, hoping to board the next train and be one step closer to a new life in Europe.